About 6 species, natives of the Old World. 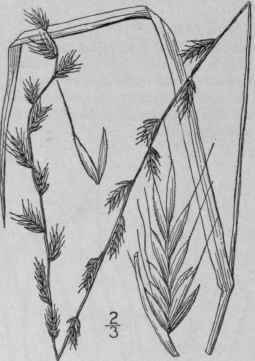 Type species: Lolium perenne L.
Empty scale shorter than the spikelet. Lolium perenne L. Sp. PI. 83. 1753. Smooth and glabrous, culms 6'-2 1/2º tall, erect, simple. 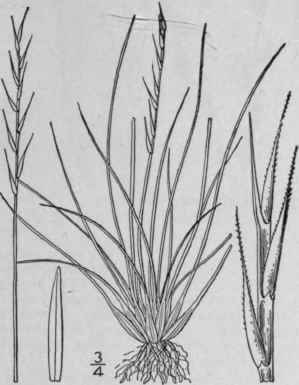 Sheaths shorter than the internodes; ligule very short; blades 2'-s' long, 1"-2" wide; spike 3'-8' in length; spikelets 5-10-flowered, 4"-6" long, the empty scale shorter than the spikelet, strongly nerved; flowering scales 2"-3" long, obscurely nerved, acuminate. In waste places and cultivated grounds almost throughout the northern United States and southern British America. Naturalized from Europe. Native also of Asia. Erroneously called Darnel, this name belonging to Lolium temulentum. Crap. Perennial Rye. Red Darnel. Red Dare. White Nonesuch. English Blue-grass. July-Aug.
Lolium multiflorum Lam. Fl. Franc. 3: 621. 1778. Lolium italicum A. Br. Flora 17: 259. 1834. Culms tufted, 2°-3° tall. 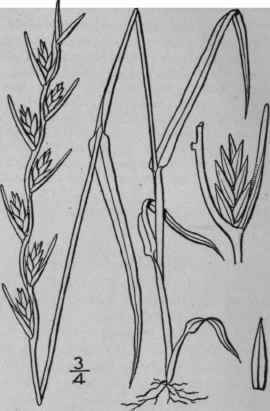 Sheaths usually shorter than the internodes, smooth and glabrous; blades 4'-8' long, 1 1/2"-4" wide, smooth and glabrous; spikes 8'-12' long; spikelets 20-30, the empty scale shorter than the spikelet, 7"-10" long, strongly nerved, the flowering scales bearing an awn equalling or shorter than itself. In fields and waste places, New York, New Jersey, Missouri and Iowa. June-Aug.
Lolium temulentum L. Sp. PI. 83. 1753. Glabrous. Culms 2°-4° tall, erect, simple, smooth. 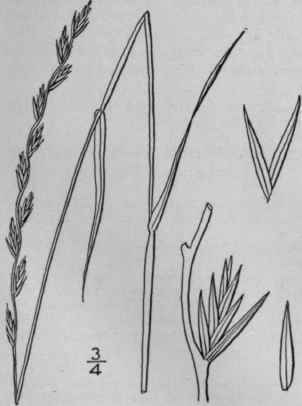 Sheaths overlapping or shorter than the internodes; ligule 1" long or less; blades 4-10' in length, 1"-3" wide, smooth beneath, rough above; spike 4'-12' in length; spikelets 4-8-flowered,5"-9" long, the strongly nerved empty scale equalling or extending beyond the obscurely nerved flowering scales, which are awned or awnless. In waste places and cultivated grounds, locally naturalized or adventive from Europe, New Brunswick to Michigan, Georgia and Kansas. Abundant on the Pacific Coast. Locally a troublesome weed. Bearded Darnel. Sturdy Ryle. Tare. Drunk. Drawke. Dragge. Neale. Cheat. June-Aug.